Shiitake Mushrooms are a common ingredient used in Asian cooking, and for good reason. They are flavorful, have a meaty umami taste and give dishes a fragrant distinctive taste when added. Did you know that Shiitake mushrooms are a good source of choline? Choline is a micronutrient that is critical in many parts of the body, including in brain and spinal cord development, as a neurotransmitter signaling muscle cell activity and in the stabilization of DNA. One half cup of Shiitake mushrooms provides 58 milligrams of choline which is about 13.6 percent of an adult female’s daily requirement (19 years of age and older) and 10.5 percent of a male’s daily requirement (14 years of age and older). Where can you get Shiitake mushrooms? You can find them mostly in Asian supermarkets and they can be bought as fresh mushrooms or in a dried form in packets. They have a lovely aroma and have beautiful patterns on their caps. Dried Shiitake mushrooms come in different sizes and also expand in size slightly when soaked, so adjust the amount you soak to use in a recipe accordingly. Dried Shiitake mushrooms also take a little time to rehydrate to use in cooking, so plan ahead. 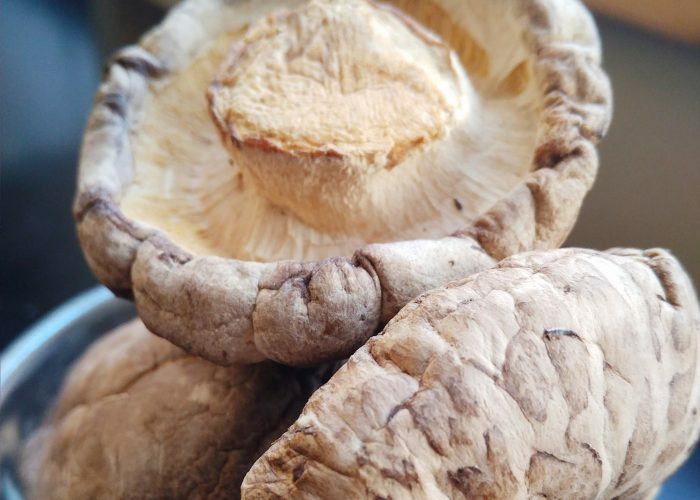 But Shiitake mushrooms are very versatile and can be used in a variety of ways such as in vegetable stir-fries, noodle dishes, soups and in dumplings. See the instructions below on how to rehydrate dry Shiitake mushrooms, and hope you enjoy cooking with them! A simple method to rehydrate dry Shiitake mushrooms for cooking flavorful Asian dishes. Pre-soak the dry Shiitake mushrooms in a bowl of very hot water (e.g., just boiled), with stems facing down. The bowl should be at least half full of water. Expect the mushrooms to float in the water. Let the mushrooms soak for at least an hour or until completely soft. Once fully soft, rinse the outside and undersides of the mushroom caps well under cold running water. Chop a little bit off the end of each mushroom stem, then slice the mushrooms up (cap and stem) into long thin strips (or diced sized pieces depending on your recipe). The amount of time it takes to rehydrate dry Shiitake mushrooms really depends on their size. If the Shiitake mushrooms are small, they could be softened enough for cutting within 20 minutes if placed into hot 'just boiled' water, giving you just enough time to rehydrate them on the side while prepping other ingredients for cooking. So check the size of the dry Shiitake mushrooms you have on hand when planning the amount of time you need to rehydrate them. If you have plenty of time, use cold water to soak the dry Shiitake mushrooms (but expect it to take longer to get the mushrooms completely soft and ready to use) as this minimizes flavor loss from the mushrooms into the soaking water. I often just put them in a bowl of cold water, and place the bowl in the fridge in the morning, so that by evening time, the mushrooms are already soft and ready to be used for cooking a dish for dinner.